Posted by ColoradoPatriot at 7:32 pm - May 23, 2013. That old corny 80s PSA* came to mind today as I noticed that one of the two gentlemen Tim Gill my state sent to the Senate is suddenly in high dudgeon over the IRS criminal activity scandal that everybody seems to be recognizing as exactly what happens when too much authority is given to the Leviathan state find so fascinating these days. Among Senator Bennet’s questions: “I don’t know how we get to the bottom of it, but I think somebody needs to be able to answer that. It doesn’t seem like it’s asking too much.” The “that” he’s referring to is who directed the illegal and unconstitutional decision to target Tea Party and other conservative groups for extra scrutiny. Here’s a hint: It was you, Senator. Perhaps he doesn’t recall, but Senator Bennet was one of seven luminaries who signed a letter to then-commissioner of the IRS Douglas Shulman in February last year demanding higher scrutiny of 501(c)(4) organizations. For instance, long-time partisan operative Karl Rove is a senior official behind a 501(c)(4) “social welfare” charity, yet it’s common knowledge that his organization exists to elect and defeat specific political candidates. Elections operations such as Mr. Rove’s should not be allowed to masquerade as charities to take advantage of their tax exempt status and hide their donors from the public. It’s the IRS’s job to enforce the tax code and make sure that “social welfare” organizations are what they say they are. Funny he couldn’t think of any leftist, statist 501(c)(4) organizations. Considering the circles in which he travels (he’s now the DSCC chairman), that seems pretty unlikely. That he chose Karl Rove to target isn’t surprising whatsoever. That he is now feigning offense that the IRS followed his lead and did his bidding is also not surprising (he’s a politician, after all). What would be much more sad than surprising would be if he gets away with it. I suppose that’s up to my fellow Coloradans. Posted by ColoradoPatriot at 4:51 pm - August 2, 2011. If you’d please excuse my continued self-indulgence. While the VP was calling us terrorists, the Senate and president were further committing us to paying their bills we’ll never possibly be able to afford, the markets were tanking, and apparently it’s hotter’n’hell everywhere else in the country, I extended my celebration of the Centennial State’s birthday into today. 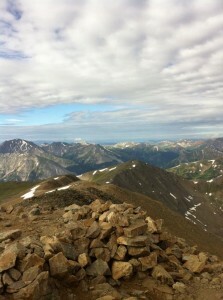 That’s Mount Elbert, Colorado’s tallest (and our Nation’s #14). I was the first one to summit today, so for a brief moment was the tallest person in the state, and quite possibly in North America. Not bad. Posted by ColoradoPatriot at 10:28 am - August 1, 2011. Today, August First, my great Centennial State of Colorado marks its 135th birthday. On this date in 1876, the territory between the 37th and 41st parallels and 102° and 109° West was designated the 38th of the United States of America. Ours is a beautiful and bountiful state with the vast prairies in the east, the majestic Rocky Mountains separating the continent, and awe-inspiring vistas on our Western Slope. 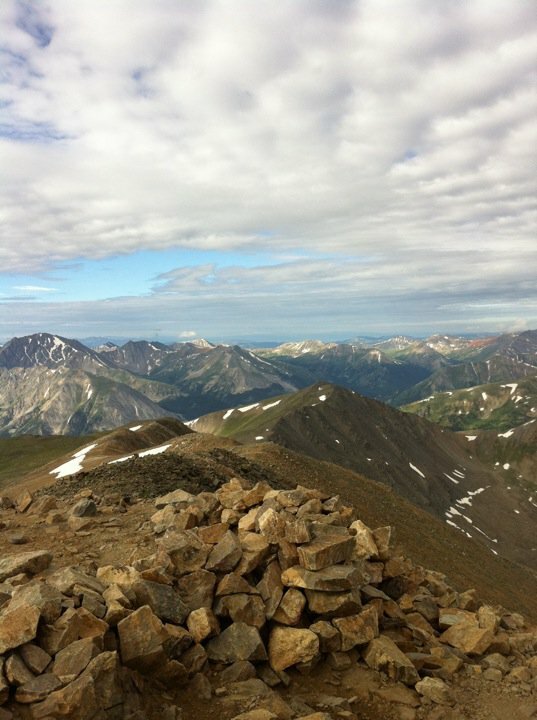 Colorado is home to 53 of the 88 US mountains over 14,000 feet—its most famous, Pike’s Peak being the inspiration for the song “America the Beautiful”. Colorado is home to exquisite wildlife, endless outdoor activities, and—if I may say so myself—some of the best people you’ll ever meet. If you’re looking for a getaway from the record heat and general misery of the East Coast this summer, or if you’ve had enough of earthquakes and sharks out West, you’re invited: Come out to Colorado and see what we have to offer! 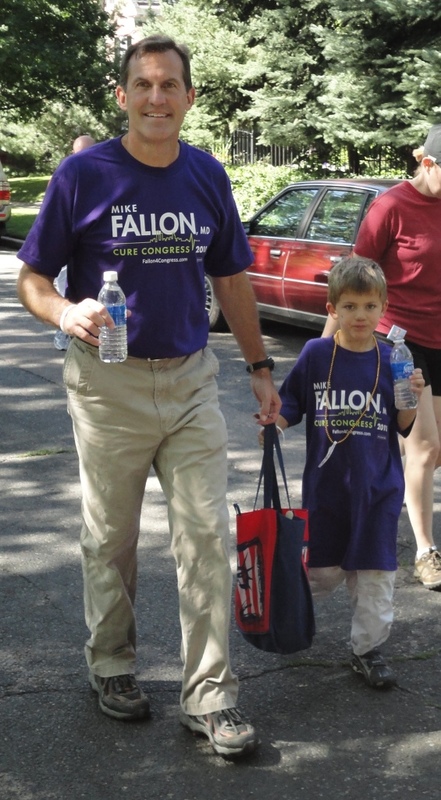 Can Mike Fallon Win in CO-1? Posted by ColoradoPatriot at 9:09 pm - October 21, 2010. I don’t have too much time here, as I’m about to step out to see a movie, but just wanted to point you toward some good news for our man in Denver, Dr. Mike Fallon. Now is a great time to show what a surge can do. I invite you all to visit Mike’s website, donate money, or volunteer. We’ve NEVER been this close in CO-1. Help us make it happen! Posted by ColoradoPatriot at 6:11 pm - September 25, 2010. Things must be going well for Republicans this year. 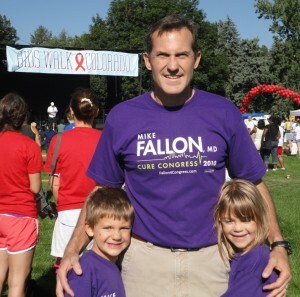 While I know how great a campaigner Dr. Mike Fallon is, and how much he deserves more national support, I was resigned to the likelihood that the big-wigs of the Republican party were writing off (as they do every year, stretching back to the tenure of that other hag) Colorado’s First Congressional District in 2010. In fact, Diana DeGette, who feels she owns the seat, is even using this great news to try to drum up fund-raising support of her own. This can only mean good things for us. And no better time for all of us to help this excellent candidate by volunteering, or if you don’t live in CO-1, contributing as best you can. Posted by B. Daniel Blatt at 9:57 pm - September 20, 2010. The National Republican Congressional Committee has elevated Dr. Mike Fallon’s campaign against six-time incumbent Democratic Rep. Diana DeGette in Colorado’s First Congressional District to “On the Radar”–recognizing the campaign’s accomplishments and the increased competitiveness of many seats previously thought unwinnable before this cycle. Help Mike cure Congress by clicking here to support his campaign. Posted by ColoradoPatriot at 2:43 pm - August 14, 2010. This morning I had the pleasure of joining CO-1 Congressional candidate Dr. Mike Fallon, his two kids, mother, and some members of Denver’s LCR chapter at Denver’s AIDS walk. No sign of Diana DeGette. Maybe she heard he’d be there (she has a tendency to avoid those who don’t agree with her—like, for example, her constituents). 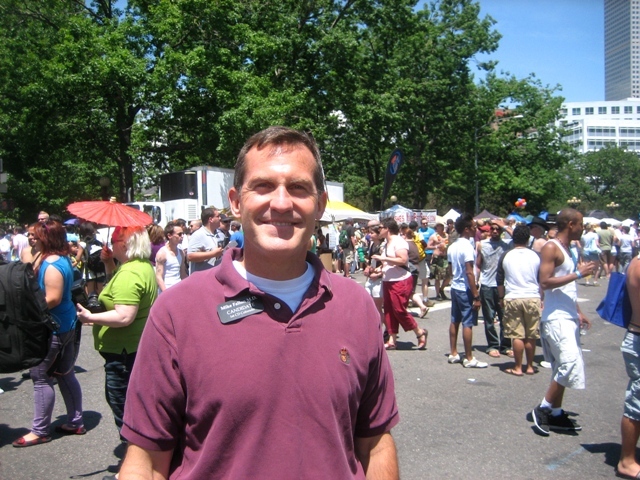 Mike’s a great candidate, and as we witnessed earlier this summer when he joined me campaigning at Denver Pride, he is incredibly comfortable and welcoming among gays and lesbians. His platform of reform and individual liberty and responsibilities should resonate not only with gays and lesbians, but all Americans who want government out of our lives (seems I recall that was something we used to want, no?). Had a great time walking with Mike. I invite and encourage you to forward your support and even volunteer to help Mike “Cure Congress” this fall if you’re a Denverite, or to make friends of yours who live here aware of him as getting above the din of our other higher-profile races in Colorado is a challenge this year. Posted by ColoradoPatriot at 12:32 am - June 21, 2010. Yes, that’s Mike Fallon, MD*, campaiging today at the Denver Pride Fest. Yes. A straight Republican at the Pride Fest. Word has it DeGette was somewhere around, but I didn’t see her anywhere; and Jared had his own booth (likely, I surmised, he actually owns that section of the actual street). I and a few of my friends walked with Mike and a top campaign worker of his around Civic Center for about two hours and stopped to hand out information and Mike answered questions and spoke to anybody who was around. Posted by ColoradoPatriot at 2:57 pm - June 12, 2010. I just got back from a late breakfast with a representative of Mike Fallon, who’s running this year in my home district of CO-1 (Denver). We had a wide-ranging discussion about policies and what it’s going to take to get our Nation back on track. I am convinced that Mike is the right choice to represent this district in Congress and am proud to endorse him and ask you to join me in contributing to his campaign and contacting your friends and relatives in Colorado’s First Congressional District and asking them to vote for him. Having met Mike and his family, I can tell you, he’s the real deal. He’s charismatic, attractive, totally genuine, and ultimately electable. I’m not exaggerating when I say, think Scott Brown. Mike is not a politician and is utterly approachable. I think these characteristics will ultimately do him very much good in this cosmopolitan yet Western pull-no-punches district. Need more incentive? He’s running to unseat ultra-Left bazillion-term Pelosi lackey and Deputy Majority Whip Diana DeGette, the only woman who could live up to Pat Schroeder’s embarrassing legacy of profligate spending, disrespect for life, and disdain for liberty. And she’s been doing it for over a dozen years. It’s beyond time to retire her. That such a great candidate has come along in Mike Fallon only proves the providence of this time in Colorado politics. Please join with me in doing whatever you can to help make Mike one of dozens of Republicans to unseat undeserving Democrats in the 112th Congress. Posted by ColoradoPatriot at 10:12 pm - March 29, 2009. I would like to take this opportunity to congratulate Colorado for placing 4 of the top 20 cities on the Forbes list of Best Places For Business And Careers in the US. Bruce will no doubt chime in (NC has 6. Good grief, aren’t some of those, like, the same city anyway? ), but I’ll crow for the Centennial State till he comes around to show us up. How long we stay on the list is hard to say. The state is currently overrun by Leftist legislators and a rabidly anti-business despot resides at 400 East 8th Avenue. Boulder is, well, Boulder. And Denver is similarly a dark shade of blue. – Nick (Colorado Patriot) from HQ. Posted by ColoradoPatriot at 11:46 am - January 30, 2009. What anybody who lives here knows, Denver is the best place in the world. Now, no less an authority than Pew Research has verified what we all know: You can’t get better than Denver. And believe me, with politics the way they’ve been going out here, we could use some more conservatives. So mount up, young Republicans, and Go West!